Note: I focus on cross-country skiing, snowshoeing and skating in this article. There are different kinds of skis, but most beginners start with what are known as classic skis. This is what you’ll usually find for rent, too. Then you’ll need to choose between skis with scales (also called waxless), or skis that require wax. This is in order to avoid sliding backwards on the snow. When you rent, usually you’ll get waxless skis automatically – they’re easy and ready to use. Otherwise you will need to put wax on your skis each time, and there is a different wax for each temperature and snow condition. Some people enjoy the art of waxing skis, but many beginners opt for waxless skis. You’ll need to get skis, bindings and boots as well as poles. The bindings and boots need to match – there are many different systems. 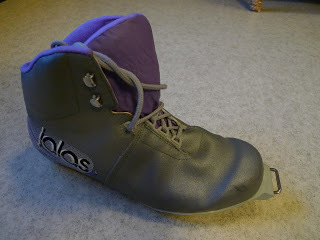 Bindings are what attach ski boots to the skis. When you rent, everything comes together anyway. When you buy, it is usually cheaper to buy a full package. As for the size, it is a bit complicated, so it is a good idea to talk to a sales person in a sports store and try the skis on before buying them. The boots should feel comfortable with thick socks. The skis should generally be 25 cm taller than you. They should be even shorter if you are very light, or a beginner, and should be longer if you are big. Poles should come up to your armpit. There are many shapes and forms of snowshoes. Old-style wooden snowshoes are charming but these days people usually get the new high tech light weight ones. The new ones are usually lighter and easier to walk in, and have crampons on the bottom, permitting you to go up steep hills. Big or long snowshoes are helpful if you’re crossing deep snow, but are more tiring in general. Around Montreal, trails are well-compacted usually, so you can often get away with a smaller, lighter pair of snowshoes. Often when we snowshoe on steeper trails we bring poles. You’ll need any normal winter boots that you can wear with the snowshoes that will keep you warm and dry. Boots should come up above your ankles – otherwise, snow will get into your shoes. There are hockey skates, figure-skating, and ‘generic’ skates. You’ll need to decide based on how you’d like to use them and comfort. Many people wear hockey skates even for every day skating. Wear a thick pair of socks as extra padding. If you are just starting, you can also bring a helmet, knee pads or wrist guards. This is up at the top of Mount Royal. The Bus 11 drops off there. It is a convenient place to rent and you don’t need to reserve ahead of time. You can rent cross-country skis for a few hours for about $18. Bring photo ID – they’ll need to keep a piece of identification. You can also rent snowshoes or skates here. Note that there is always at least a short line-up, and on nice days, there can be long line-ups. Usually they have enough of everything, but again, on a very beautiful day, they could run out of certain sizes. You can rent cross-country skis and snowshoes in many of Montreal’s major parks. See here for more info. Other Skating Rinks that Rent Skates in Montreal – Parc Lafontaine, the Old Port skating rinks, Parc Jarry and more. Sells new skis, snowshoes and skates, as well as sports clothing. Also rents skis and snowshoes and winter camping gear. Now also offers downhill ski gear to buy and rent..
8278 St-Laurent, Near metro Jarry. Call 514-384-3582 or 514-384-1315 for opening hours. http://www.poubelleduski.ca/ They sell used and new skis and skates and possibly snowshoes. They are known for their low prices. You can rent skis and skates for the whole season and then either return them or buy them minus the cost of the rental. Across the street at 8267 St-Laurent, you can also check out Dépôt du plein air, where there is some fairly reasonably priced new outdoor sports clothing. They also rent snowshoes, and at least in the past, you could rent for free once per season! Sells new and used skis, snowshoes and skates. Rents and sells new skis and snowshoes, as well as sports clothing. Additional location at 5190 St-Laurent (Métro Laurier). Be sure to reserve a few days IN ADVANCE. The first time you rent cross-country skis, plan on picking up your skis the day before so you have the time to try on a few different sizes of boots. 4375 St-Laurent. Closed on Mondays. Open until 8 p.m. on Thursdays and Fridays. http://www.lechainon.org/. Sells many old hockey skates and other second hand items. Winter coats, scarves etc. Other second hand stores have similar or even better offerings, including Renaissance, Fripe-Prix, Salvation Army, Value Village. You can find used snowshoes and skis/boots for $30 and up, skates for $15 and up. All sorts of gear for rent, very inexpensive, for members. It’s about $30 to become a member for the year. Previous articleGive the Gift of Winter! Next articleHow to Learn Skiing, Snowshoeing and Skating This Winter!